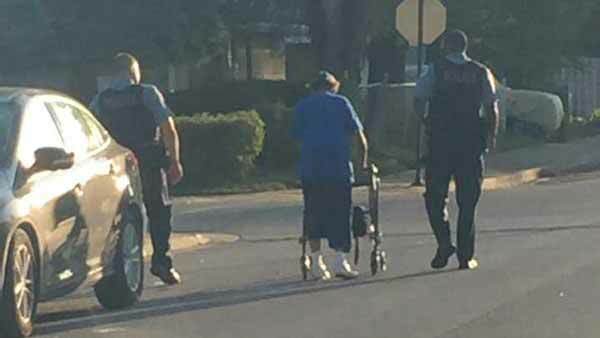 CHICAGO -- Two Chicago police officers helped a woman in need Tuesday after a call came in that she was wandering around her neighborhood for hours. Officer Haro and Officer McDonald found the woman, who was lost and disoriented, near the intersection of 95th and Halsted, according to a post on the Chicago Police Department's Facebook page. When they asked her if she needed help getting home, they realized she was non-verbal, so they started writing on a piece of paper to ask her questions. They discovered that her home was just a few blocks away and helped her walk back home. At her house, the officers noticed that she lived alone and that she had very little food, so they made a run to a local grocery store to stock her pantry and fridge out of their own pockets. The officers said that when they came back with the food, they were thanked with tears and a hug from the woman, before they went on to their next job.